ESoDoc – European Social Documentary is the training initiative for media professionals and “cross-thinkers” who want to increase impact and outreach of their documentary films and cross-media projects by developing new storytelling skills, networking over different platforms, discovering new forms of team building, of producing and financing and new distribution strategies. ESoDoc offers three intense one-week residential sessions held over a period of six months, combined with Extended Online Sessions (EOS) for market related topics, project tutoring and networking with festivals and other market events. With the support of top-rated professionals, participants will improve their storytelling skills, master the art of project developing, prototyping and pitching. You will discover new forms of team-building and networking and will get an insight in international coproduction, financing and distribution strategies. During the workshops, participants are tutored by a network of international experts on the development of the projects. Emphasis is placed on building up strong storytelling along with new production possibilities (collaborative media) and communication tools. We explore new funding and distribution strategies, both on traditional channels as on new media channels, such as the web and the new crowdfunding platforms. ESoDoc trains its participants to be better equipped for the challenges of the changing audiovisual market, and enables the professionals to better engage audiences across different platforms and maximize the outreach and impact of the projects. The workshop is open for professional with or without an own project. Participants without a project can not propose a new project during the training. They will have the chance to team up during the first session with a participant with a project. All participants who want to develop a crossmedia project are asked to have a graphic designer in their team by the second session. participate to the Extended Online Sessions (EOS) for project tutoring and networking with festivals and other market events. ESoDoc participants are committed to social issues and eager to explore new creative forms and communication strategies to face the challenges of the changing media world. We are looking for documentarians, producers, journalists, web-designers, programmers, game designers, and NGO-communication representatives who are willing to extend their production possibilities to new sectors, new forms and new platforms. We can accept up to four participants from non-EU countries. The participation fee covers tuition, room and board for all three sessions. Please note that accommodation might be in single or a shared double room, according to availability. Travel expenses are not included. Four (4) full scholarships are available. A „full scholarship” would cover the enrollment fee AND the travel costs for all three sessions. In case of a high number of scholarship requests, we might assign a „partial scholarship„, which would cover the enrollment fee OR the travel costs. If you want to access scholarship funding, you must provide 1 copy of your latest official tax return and also explain the reasons for asking the scholarship together with your application. No other kind of document shall be considered. Great! Then follow this link to fill the application form. Or this link to check the guidelines for application! Otherwise, if you have questions, check the FAQ section or contact us. The Social Sciences Division of the Institute of the University of Bucharest (ICUB) invites you on Friday, 25th of November, to a conference regarding the connection between television and national identity. 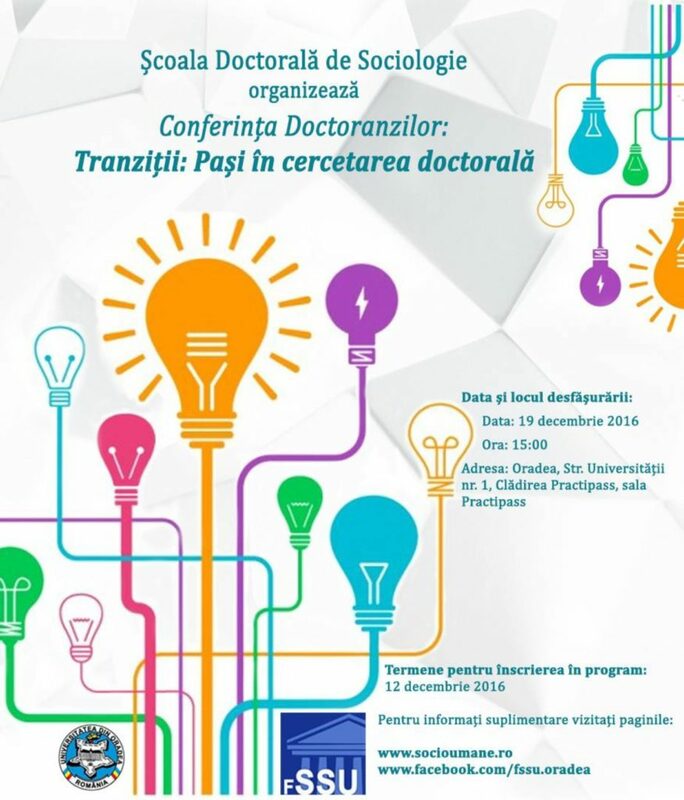 The event will take place at the Faculty of Sociology and Social Assistance (Panduri Campus, Șos. Panduri no. 90), Room 102 starting at 15:00. More information will be updated soon on ICUB website. Steffen Pötzschke, de la GESIS Mannheim, va susține o prezentare a panelului online german gestionat de GESIS-Leibnitz Institute. Prezentarea va dura aproximativ 50 de minute, fiind urmată de discuții. În centrul prezentării sunt modul de organizare a cercetării, accesul cercetătorilor la date, propunerea de pachete de itemi, aspecte metodologice șamd. Numărul de locuri în sală fiind limitat, cei interesați de participare sunt rugați să trimită un mesaj la bogdan@iccv.ro. The Social Sciences Division of the Institute of the University of Bucharest (ICUB) invites you on Friday, 18th of November, to a conference regarding the project Behind Iron Curtains (BIC70). The event will take place at the Faculty of Sociology and Social Assistance (Panduri Campus, Șos. Panduri no. 90), Room 102 starting at 15:00. The social situation of youth in post-communist societies still represents an important research interest for sociologists. Nearly 30 years of transformations passed since the fall of the Communism. However, these youngsters still don’t show all the time similar situation to their peer generation in the Western European countries. They are different both from their peers from the West, and from the prior cohorts. Hence, a specific relationship between generations but also unexpected challenges coming from the direction of globalization and post-modernization. Even though they experience the popular opposition and the fall of the Communist regime during their most impressionable years, the political socialization of the youngsters took place under difficult economic conditions, during times characterized by dramatic social and political change. There are similarities between post-communist countries and Western democracies as well, at least concerning the socialization of a new generation which shows law interest in organized politics, in school or in conventional family life. Comparative research on the youth in different societies with either common past or with either the same market orientation to labour or education can bring interesting results. Researchers interested in youth in post-communist countries have to identify new strategies for living youthfulness (juvenescence), new spaces for socialization and promote new patterns of life. We should also asses to what extent young people can bring their contribution that development of their own societies is waiting. How can we assess the condition of youngsters in societies in transition? Do they continue to be different or they are identifying with youngsters from other types of societies and first with the ones in the West? Considering how they see themselves compared to older generations, are post-communist societies marked by intergenerational cleavages? What effects can these cleavages have on the perspectives of social development? What specific contributions can youngsters bring to overcome faster and without social convulsions the transition period? Which would be their strong points and what about their weaknesses, to what risks are they subjected? How are mixed in post-communist societies the transition constraints with the ones coming from globalization, radicalization, social fluidization, inter-cultural and geopolitical conflicts? Field researches, case studies, examples of good practice and book reviews are welcomed. Vă anunțăm că a fost publicat nr. 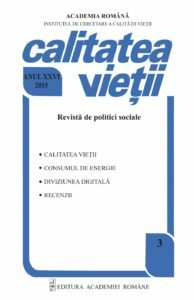 1/2016 al Revistei Calitatea Vieții. 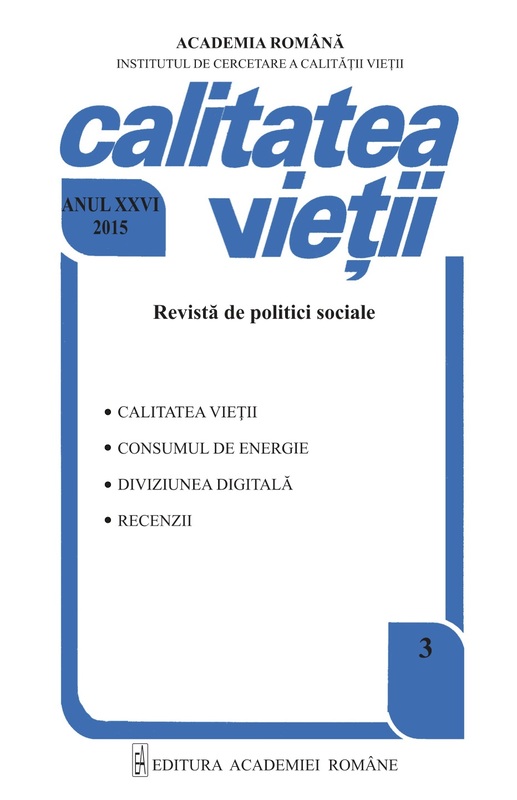 Articolele pot fi accesate pe pagina revistei la adresa www.revistacalitateavietii.ro.